Pharmaceutical Giant Eli Lilly Meets with Multicultural Groups; Eli Lilly Meets with Multicultural Groups to Discuss Healthcare in the U.S.
Lifestyle Health Pharmaceutical Giant Eli Lilly Meets with Multicultural Groups; Eli Lilly Meets with Multicultural Groups to Discuss Healthcare in the U.S.
Nineteen leaders of select, national multicultural organizations visited the headquarters of Eli Lilly and Company, the global pharmaceutical maker, for an all-day “learning lab” about the pharmaceutical industry’s role in the healthcare system. Attendees heard from Lilly’s senior leadership team, as well as, individuals working in clinical trials, research, manufacturing and medicine. Attendees also toured a drug development lab, participated in informational sessions on healthcare topics, and learned about the variety of diversity and inclusion initiatives underway at Lilly. Lilly’s senior leadership team talked about how the company values the hard work and dedication of community groups that are also committed to ensuring quality healthcare for patients and caregivers. 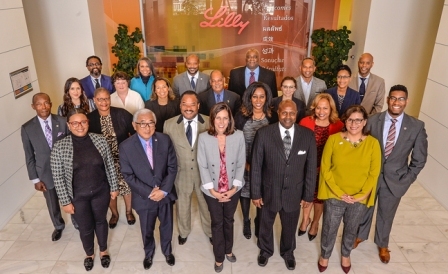 As a company dedicated to discovering breakthrough therapies, Lilly’s senior leadership team said that Lilly welcomed opportunities to share an innovator’s perspective on the biopharmaceutical industry in the United States and their efforts to provide value to the healthcare delivery system; the company’s leaders also look forward to gaining more insight from organizations that represent multicultural communities.